AC Milan take on rivals Inter in the Derby della Madonnina this weekend, and Vincenzo Montella is a man under pressure to get his team selection right. So far this season, the Rossoneri have fallen short when it matters. Losses to Lazio, Sampdoria and Roma have left question marks that need to be answered, and they would do well to start providing those answers against their city rivals. The players will of course shoulder some of that responsibility, but it starts with Montella and the starting line-up that he puts out to give the ‘visitors’ the best possible chance of walking away with all three points. One man that has to start is Andre Silva. 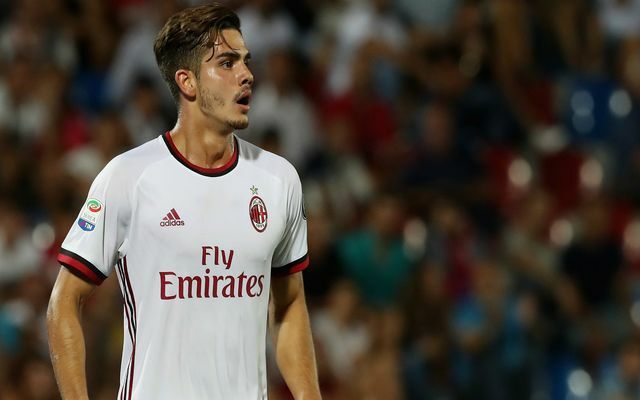 As per Sky Sports, Milan signed him for €38m this past summer and while he has impressed so far this season, he has frustratingly been underused in Serie A thus far. The Portuguese international has scored six goals in nine games, but is still searching for his first league goal for his new club. With just 208 minutes of action though, it’s been difficult for him to find that consistency. Nevertheless, as seen against Roma, he produced some real moments of quality with his technical skill and ability to create for others, while his presence up front will ensure that he’s a nuisance for the Inter backline. In turn, he will hopefully get the nod from Montella, while Suso and Giacomo Bonaventura will arguably be ideal options to provide creativity around him with Hakan Calhanoglu suspended. Much of the Milan line-up picks itself. Gianluigi Donnarumma, Mateo Musacchio, Leonardo Bonucci and Alessio Romagnoli will likely form the wall to prevent Inter from finding the back of the net, while Franck Kessie and Lucas Biglia should provide solidity in midfield with Ricardo Rodriguez on the left flank. As a result, the only other position up for debate is right wing-back. Andrea Conti has been sidelined by a serious knee injury, while Davide Calabria and Ignazio Abate have stepped up and had their struggles. Montella looked to Fabio Borini last time out, and the versatile Italian did an admirable job in being solid defensively, while attacking whenever given an opportunity with his energy seeing him charge up and down the right flank at will. While he lacks the quality needed in the final third to make the difference, he could be the answer to keep Ivan Perisic quiet by matching him for pace and frustrating the Croatian with a combative and hands-on defensive display. Perisic will be a danger man for Inter as he looks to add to his tallies of three goals and three assists in seven league games this season, and perhaps Borini could be the man to keep him quiet. Ideal AC Milan XI? Donnarumma; Musacchio, Bonucci, Romagnoli; Borini, Kessie, Biglia, Bonaventura, Rodriguez; Suso, Andre Silva.